Want to know if your organization is ready to start a data-driven social impact project? 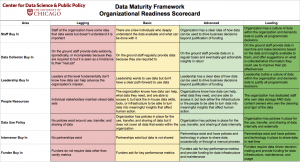 See where you are in our data maturity framework and how to improve your organizational, tech, and data readiness. The framework materials can be downloaded here, and you can complete our survey here. We’ll launch an aggregate benchmarking report around the state of data in non-profits and government organizations. We ask that each problem be entered as a separate entry (rather than multiple problems from one organization entered in the same response). 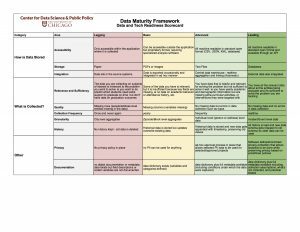 If you’re interested in attending or hosting a workshop on the Data Maturity Framework for your organization, contact datascifellows+workshop@gmail.com.